16th May 2013 – the 70th anniversary of the Dambusters’ Raid – the exact moment when, on 16th May 1943, 617 Squadron set off from RAF Scampton in Lincolnshire under Wing Commander Guy Gibson to destroy the dams of Germany’s Ruhr Valley with their ‘bouncing bombs’. As part of the official Battle of Britain Memorial, 495 specially designed Dambusters’ covers will be flown on board one of just two surviving Lancaster Bombers over Derbyshire’s Derwent Reservoir, part of Derwent Dam – an area used by the pilots for training. 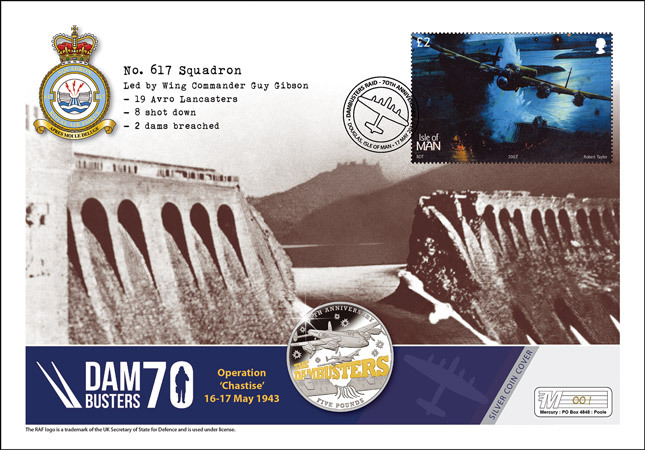 An Officially Approved Royal Air Force Commemoration, each cover features an original Dambusters’ stamp, postmarked with an exclusive cancellation dated 17th May, and an official 70th Anniversary Dambusters Coin struck in Solid 925/1000 Silver to the highest proof finish, its reverse enhanced with selective 24-Carat Gold-Plating. Due to the cover’s uniqueness and the fact that tonight’s flight will never be repeated, no more covers will ever be available once all 495 have been sold. The anniversary flight details on the reverse of each cover confirm it has been part of this historic Dambusters’ re-enactment. Commemorate the Battle of Britain by securing one of these commemoratives – click here. I love this collection! I would love to get it one day. Guy Gibson is my cousin so that’s why I would love to have it even more. Looks so amazing.